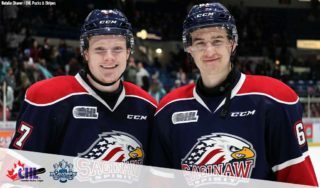 Flint, Michigan – The Saginaw Spirit (2-2-1-0) scored three unanswered goals in the third period Wednesday at the Dort Federal Event Center to put an end to their three-game winless streak in the early stages of the season. 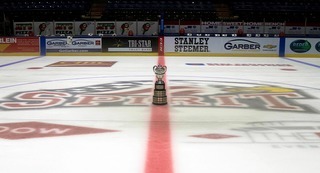 Knocking off their in-state rival, Flint Firebirds (0-5-0-0), 6-2, to start the best of eight series in the Coors Light I-75 Divide Rivalry, Saginaw captures their first win away from home, looking to win the trophy for the second time in team history. The Firebirds drew first with 2:40 into the opening frame, after Jacob Winterton received the pass from Eric Uba at the slot in-between two Saginaw defenders, hitting his mark at the top left corner of the net. The one penalty of the period came at the 12:43 mark issued to Flint, with Jake Durham receiving two minutes for hooking, leading way for the Spirit to capitalize on a Nicholas Porco poke through the legs of goaltender Emanuel Vella. Cole Perfetti was credited with the cross-ice assist and first-year team captain and Minnesota Wild prospect Damien Giroux had a hand in the architecture of the Spirit’s first of two goals on the power play. 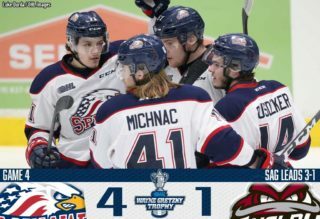 With five goals scored over the course of four games, Porco helped the Spirit rally down five goals in last Saturday’s overtime loss to the Guelph Storm at home. The power play goal is also Saginaw’s second of the year. Less than 30 seconds later, New York Islanders 2018 second round draft pick Bode Wilde earn his first goal through five games. Receiving the puck from Giroux, Bode’s slap shot near the blue line sailed past Vella for the 2-1 Saginaw lead. The Spirit went to their first penalty kill situation a minute into the second period as Wilde was called for hooking. Flint would then commit a turnover to Porco in its defending zone just 47 seconds on the man-up opportunity, giving the Sault Ste. Marie, Ontario, native his second goal of the night. Flint nearly tied the game at three with 9:20 left in the frame when Kyle Harris was tripped up right in front of the Saginaw net. Harris, who has two goals on the season, had his penalty shot denied by Ivan Prosvetov. Prosvetov, earning his second consecutive start after making his OHL debut on Sept. 22 in the loss to the Sarnia Sting, stopped 25-of-27 shots faced to up his save percentage to .810. Backup goaltender Cameron Lamour did not play while Vella finished with 29 saves for Flint. Ethan Keppan would cut the Firebirds’ deficit to one at the 10:07 mark, beating out Mason Millman on the breakaway to record his third goal this year. Wilde added the insurance goal midway through the third period, as Saginaw notched its second power play score, rifling the puck at the blue line from an assist by Albert Michnac. 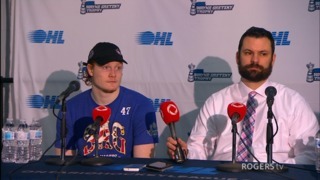 Michnac, a native of the Czech Republic, having been acquired in a trade from the Mississauga Steelheads over the summer, leads the club with eight points and is tied with Wilde for assists at five. Despite it being decided by official review after inadvertently playing the puck above the crossbar, the ruling came in favor of Jake Goldowski at the 15:01 mark, recording his second goal of the season. Perfetti would seal the deal to make it a four-goal difference with 50 seconds left. Saginaw had 35 shots on goal, losing the face-off battle, 31-21. The Spirit continue their three-game road trip into Canada, visiting the Kitchener Rangers on Friday, Oct. 5, before heading to Erie, Pennsylvania to clash with the Otters the following day. You can catch all the action on the radio with Joey Battaino and Dennis Desrosiers on FM Talk and Sports 100.5 and fmtalk1005.com. 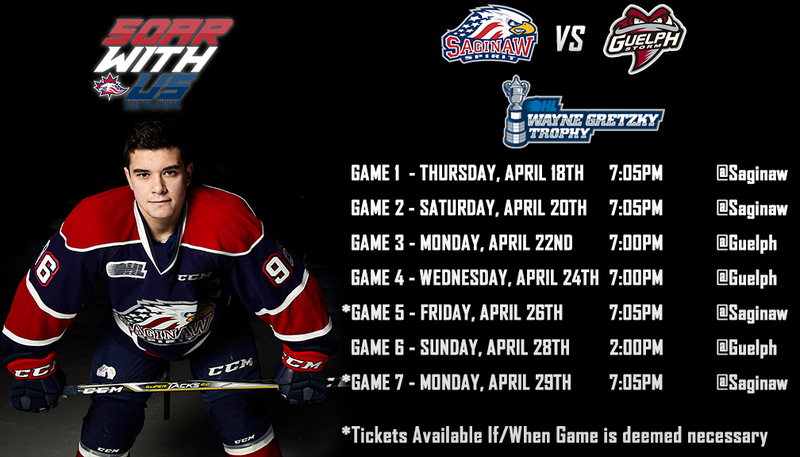 To purchase your tickets for all Saginaw home games, call (989) 497-7747, visit saginawspirit.com or by visiting the Saginaw Spirit Store at 5789 State Street, Saginaw, MI.